Direct wire detectors are hard wired diffusion sensors to the controller and do not require a transmitter. They are, therefore, more economical than detectors requiring a transmitter. Direct wire detectors can only be used with the Beacon 110, 200, and 410 controllers. While the choice of gases is limited for hard wire detectors they can be an economical choice when available. In general, the use of a transmitter is preferred for distances over 300' to 500' to simplify calibration. Sample draw detectors have an integral pump, which draws the surrounding air to the detector. They are the preferred choice when used in larger areas where there is no specific point at which one can expect a gas leak. All sample draw detectors used with the Beacon Series have transmitters. Detector assemblies required. Provide gas, detection range from the list below so that we can provide the best combination for your application. Diffusion detectors rely on the natural flow of air to bring the sample to the detection head. These are an excellent choice for gas cabinets or other forced flow environments where the detector is situated in a constant air flow from the potential gas release to the detector. All diffusion type detectors used with the Beacon Series have transmitters. Most sensors require a transmitter to amplify the sensor signal, and to convert the gas sensor signals into a standardized output, such as 4-20 mA, for transmitting the signal to a controller. The transmitter is usually in close proximity to the sensor, and zero and span adjustments must be done at the transmitter. 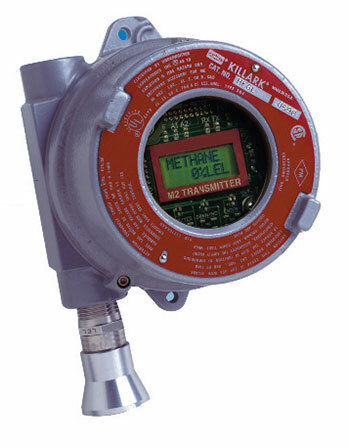 Note that some sensors and controllers do not require the use of a transmitter for LEL or Oxygen detection (Beacon 110, 200, and Beacon 410), and also one is not needed for short distance wiring of H2S or CO sensors for the Beacon 110, 200, and Beacon 410. All transmitters used with the Beacon Series are operated from 24 VDC, and utilize either 2 or 3 wires. In general, even if a sensor can be used with out a transmitter, the use of a transmitter is often preferred for distances over 300' to 500' to simplify calibration. Detectors for many other gases are available. Tell us your requirements.